When this extension is installed, the admins will get a new section in the reservation details page where they can upload custom documents (e.g. scans with bank transfer confirmation or signed contracts etc., max size 5 MB) connected to given reservation. Also, you can add a tag to the reservation completed and/or reservation details templates to allow your customers to upload these reservation-related documents themselves. It is therefore possible to add a link to the page allowing the upload into the emails sent to the customer so they can upload the document at any later time they like. Once uploaded, the documents can be accessed by the admins but you can also attach links to them in emails or in other templates, perhaps if you want the customer to also get access to them. 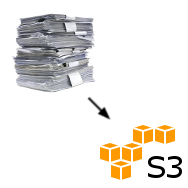 In order to use the download version you will need to create your own Amazon S3 account. You can read more and sign up at http://aws.amazon.com/s3/. Your account will be then used for all uploaded documents, none will be kept on our servers. Of course you will need to pay for your S3 account to Amazon. We will take no extra fees for this. If you're concerned about the security of your data then you may prefer to choose this version because it's your own Amazon account that will host your files. You pay only once and can use the extension for as long as you like without additional fees from Planyo. CHF 60 After purchasing, you'll be able to download the extension files and install them on your own server. You pay only once for the extension but a setup procedure on your server is needed and your server needs to support PHP. The subscription version is much easier to set up, there's no need to install anything on your server or create your own Amazon S3 account (our account with Amazon will be used instead), you just sign up for the extension and it's ready to use! We guarantee that your data will be stored for at least 3 years after the associated reservation take place. The first month is free so you can test the extension very easily, also in case you prefer to get the download version later on. Very easy set up, only choice if you don't have your own server (or you have one without PHP support) or if you simply want to get started without hassle of going through the setup. If you need more flexibility in the future, you can cancel the subscription and purchase to the download version at any time in the future. With the subscription version you have a flat monthly rate and you don't need to make any payments to Amazon. Your data will still be safely stored on Amazon's servers. CHF 20/month Buy monthly subscription to the extension. The extension is hosted on our servers so no installation is required. This is the easiest way to use the extension.